Voodoo13 complete 3 arm kit for the 2008+ Honda Accord and 2009-2014 Acura TSX/TL gives you the ultimate in adjustment for fine tuning the rear suspension. If you’re looking to adjust rear camber by more than 1 degree then you must upgrade to a complete 3 arm kit due to the factory arms not providing enough adjustment. Our arms are engineered and designed for high performance street and race vehicles. They replace the soft rubber OE bushings with rigid spherical bearings for increased handling and performance, but may slightly sacrifice noise and comfort compared to arms that use rubber bushings. 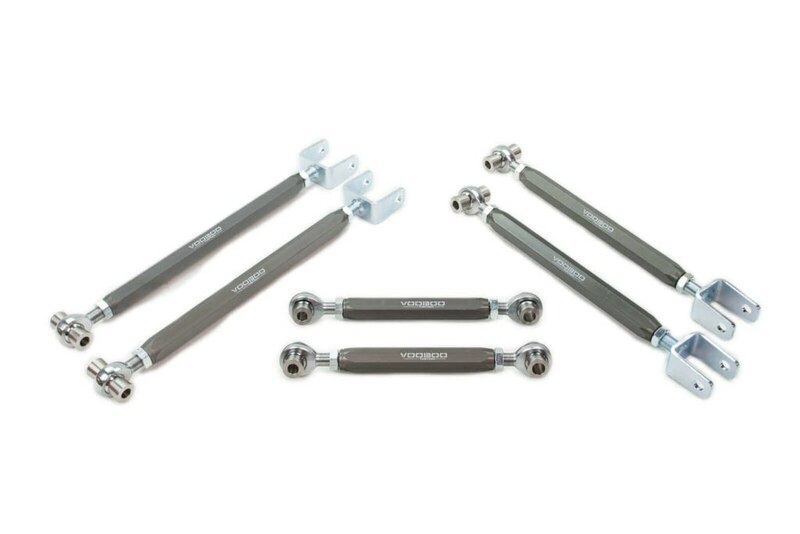 The adjusting rods are made from 6061-T6 aluminum which ensures our arms are incredibly strong and lightweight. MIL-A-8625 Type III Hard Anodize finish is available in two colors Hard Clear and Hard OD Green. Our steel brackets are CNC manufactured with TIG welded construction. CNC stainless steel spacers are machined in house and work in conjunction with high quality made in the USA QA1 spherical rod ends. Class 10.9 zinc coated nuts included to replace the factory welded on nuts (camber and trailing arms).